Daytona 500 and TrackBond | My Asphalt Dr. If you watched the Daytona 500 this past February, then you probably saw TrackBond do its thing to help “save” the Daytona 500. The Daytona 500 was forced to stop for a red flag with 40 laps left. Juan Pablo Montoya’s racecar crashed into a jet dryer on the track during a caution flag which caused a massive inferno on the racetrack. This was the first postponed Daytona 500 in history; and it was actually postponed twice during the race. 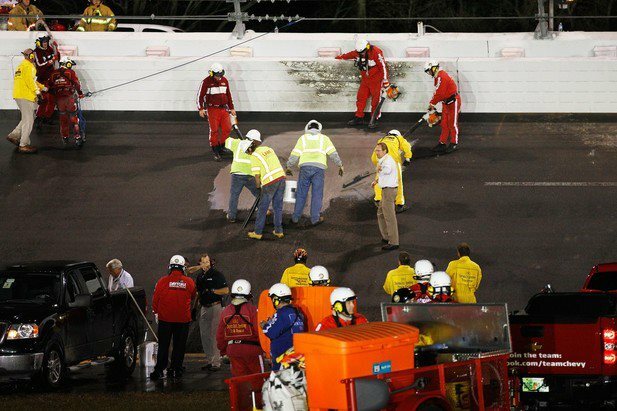 Track crews were actually seen coating the damaged racetrack with TrackBond, and it’s what allowed the Daytona 500 to finish. On MyAsphaltDr we discuss the durability, functionality, and versatility of StreetPrint, StreetBond, StreetPrintXD and other asphalt coating technologies. But we haven’t talked about TrackBond 50 yet. So here’s a perfect opportunity. TrackBond 50 is a cementitious coating product that is specifically designed and engineered to repair and maintain racetracks. TrackBond 50 is successfully used on many major racetracks throughout North America to solve asphalt problems. Depending on weather conditions, track repairs can be completed and race ready in less than 10 minutes. Which makes it perfect for actual race-day repairs and quick fixes. Read more about other Daytona 500 “winners” besides Matt Kenseth.